It appears that Mantic Games has filled a massive void with the announcement of their Hellboy board game. The gaming company announced the board game through Kickstarter, and much to their surprise, the game was fully funded in just 18 minutes. While Mantic Games anticipated being able to fully fund the game, they didn't expect it to raise over a million dollars in 48 hours. 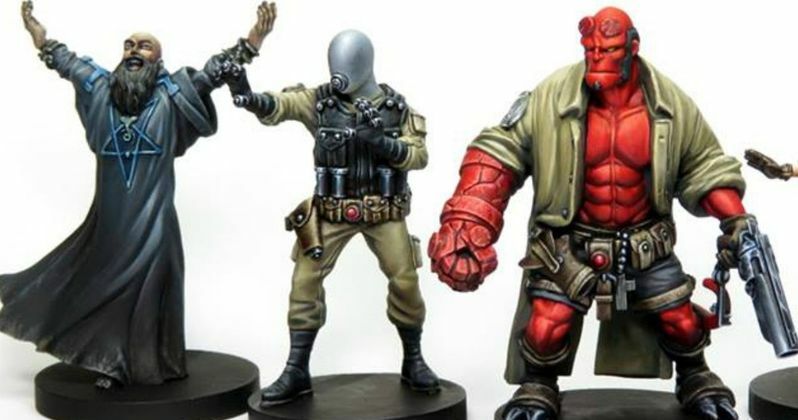 Apparently, a Hellboy board game was something that fans have been clamoring for. It's not really a surprise that Hellboy: The Board Game is so successful. A quick glance at what the game has to offer reveals awesome miniatures based off Mike Mignola's comic artwork. Plus, the game look pretty massive. Mantic Games had this to say about Hellboy: The Board Game. "Inspired by the legendary tales of horror, myth and folklore by Mike Mignola, Hellboy: The Board Game is a fully cooperative experience for 1 to 4 players. You become a member of the Bureau for Paranormal Research and Defense (BPRD), ready to investigate occult threats that threaten our very existence. You will explore gothic locations, hunt down clues, discover artefacts, fight horrific creatures and face off against terrifying bosses." Hellboy: The Board Game went live on Kickstarter earlier this week and still has 27 days to go as of this writing, so it will be very interesting to see just how much the game ends up raising in the next month. The board game is Mantic's 16th consecutive successful Kickstarter campaign and its highest earning. The project currently has nearly 10,000 total backers, which is more than double the number earned by its previous most successful campaigns. Who would have thought that the demand for a Hellboy board game would be so high? Hellboy: The Board Game is designed by James M. Hewitt, who is responsible for DreadBall, Blood Bowl 2016, Necromunda: Underhive, and Warhammer Quest: Silver Tower. The board game features incredibly detailed, pre-assembled PVC plastic miniatures that capture the unique look and feel of Mike Mignola's artwork. Additionally, the Hellboy game looks absolutely massive with a ton of add-ons to customize the gaming experience. Fans of the Hellboy franchise might not even be buying the game to play, instead simply because it looks so good. Hellboy: The Board Game is currently still accepting funding and will do so until May 25th, so there's plenty of time to claim your own board game. As for the Hellboy movie franchise, Neil Marshall's gritty reboot is expected to hit theaters on January 11th, 2019. Fans have been skeptical of the new reboot with a new director and new actor portraying the titular character, but excitement is high to see a movie that is heavily based upon Mike Mignola's original source material. You can go check out Hellboy: The Board Game and get your hands on your own over at Kickstarter.